I recently watched Housewife 49 written and starring Victoria Wood, who has developed into an incredible all round artist and I enjoy watching her “bio-dramas” very much. Nella – the main character – was involved in a mass observation project during the wartime years and it struck me when she folded some pencil written scraps of paper – joined together with a scrap of wool – that that was something my mum used to do. This led to all sorts of conversations with DH who was a war baby (can’t you tell from the fridge !! – nothing will be thrown away until it walks out or surrenders !and the house is a tribute to the make do and mend era– everything will come in handy sometime! ) and it then occurred to me what we had and have lost in the way of the “written” word. Blogging seems to have replaced the written diary. Whilst I think blogging is brilliant and I am a great fan – I am fearful that there are so many “words” that they will be lost to future generations. I have kept an informal diary over the last 20 years – a series of notebooks with thoughts, scribbles and general items which attract my eye rather than any serious prose. I stopped this in about the middle of last year due to the sheer nature of the grief I was encountering, time constraints and just general depression – what on earth would I have to say which would be of interest to anybody in the future?. When I was going through them on Saturday this week – they fell off the shelf in the sitting room so I had to do something – I realised that actually the “me” of the future was missing out – I use them as source books for ideas, and also my children would probably get to know me a lot better than I know myself. So back to the notebooks and blogging I shall go….On my writing journal programme I have the facility to write to myself in the future. I shall use that. Now it is just not the act of blogging that I enjoy – but the reading of blogs.. I am going to make it a new week’s resolution to try to comment more – as I love reading blogs so much. Still never needed an excuse to knit so not starting now. 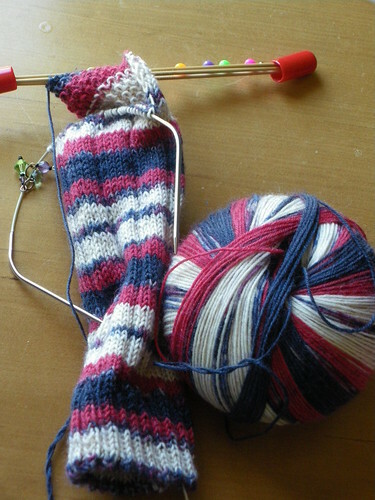 I have two other pairs on the needles as well – and will chat about those later in the week.